I started a thread about this, called Celadon art gallery back in April. But I actually missed the news article. It is good stuff. And it is nice to see the comments on Tal.com. Wow, those are some great pieces! I think there's still one or two more pieces still to go with this set from Adam that aren't yet complete. Also, as another possible piece of good news if you like the art in that gallery - I'll own the pictures once they're all finally complete AND I'll probably have some mock-up sketches as well. Basically, I paid for all of that artwork out of my own pocket BUT I got it all at a far cheaper rate than Adam Black normally charges. One of the things he does is a variety of mock-ups and test drawings. AND he said he was going to send those on to me as well as the prints themselves when they were all done. That is seriously AWEsome =D. Adam is a great guy. My eyes thank you Doug!!! writermonk wrote: I think there's still one or two more pieces still to go with this set from Adam that aren't yet complete. That is more than awesome. It is awesome for Adam to work at cut price rates to get these unpublished books finished. It was already awesome that you (and other designers) have donated these books that you never got paid to write. Going above the initial gift (of the Lost Books) and actually paying to fund the creation of the art puts awesome on top of awesome, Doug. With Adam adding a side order of awesome. That has to be awesome cubed. Thinking about this. The way that this stuff has happened. I do wonder, if people like you and Adam can do this. Would it be possible to create new Tal books and then use something like Lulu or CreateSpace to publish them and split up the royalties afterwards so that the creative people and SMS get paid later down the line? If something like that was possible then maybe a Kickstarter campaign could build up enough money to get the process going. Right now, SMS's position on things (and he still owns the rights to the material; he just allows them for free personal use download) is that: 1) he's made his money from Tal, 2) he's not as involved in the gaming scene any longer, 3) he still loves and cherishes Tal and if (that's a big if) anything new is done, he wants it to the same high standards as the existing stuff. There are periodic rumors of something Tal related that pop up every year or so, but nothing has come of them so far. writermonk wrote: Right now, SMS's position on things (and he still owns the rights to the material; he just allows them for free personal use download) is that: 1) he's made his money from Tal, 2) he's not as involved in the gaming scene any longer, 3) he still loves and cherishes Tal and if (that's a big if) anything new is done, he wants it to the same high standards as the existing stuff. There are periodic rumors of something Tal related that pop up every year or so, but nothing has come of them so far. 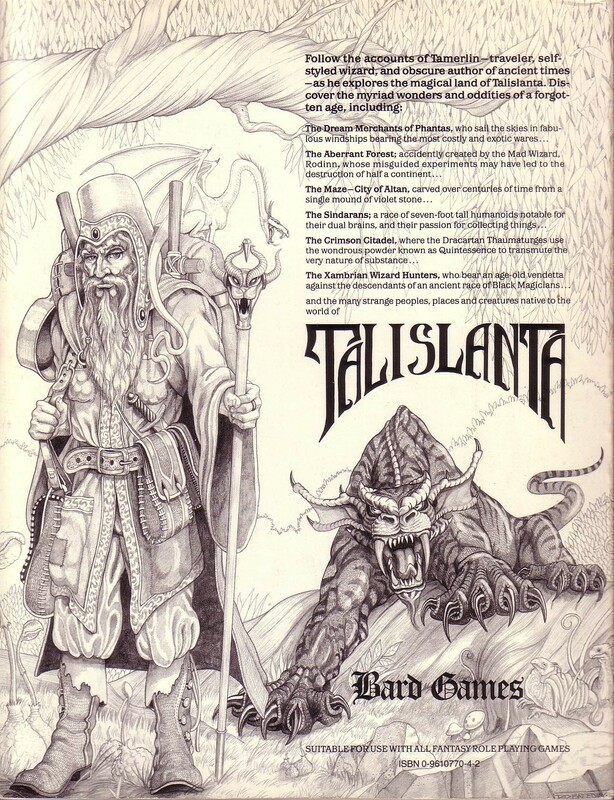 But it seems to me that the thing that kept causing problems for Talislanta was the companies licensing it and then running out of cash. 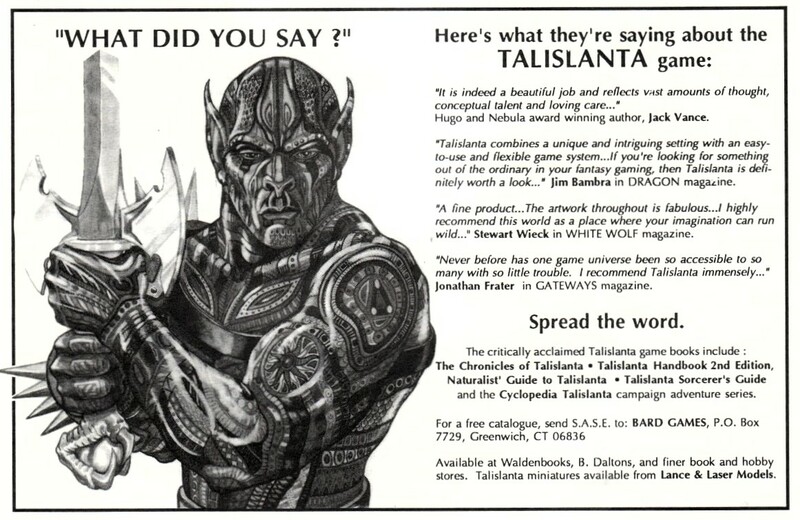 We now live in a time where Print on Demand and PDF distribution methods mean that if SMS ever wanted to un-retire Talislanta, so that people could buy new things, it could be done without the sort of massive distribution chain that has been required in the past. I know there have been a few near misses with products. Maybe one day the new tools could be used to make it possible for something to get to market. If SMS has made his money from Tal and doesn't need it to turn a big profit, that might even help this sort of thing to happen one day, because profit margins could be tighter and the focus could be on breaking even, paying authors and artists for their time and making sure everything is up to the correct standard before fans are allowed to buy it. Unless or until that happens, thanks for funding some awesome Talislanta art out of your pocket. Big Mac wrote: If SMS has made his money from Tal and doesn't need it to turn a big profit, that might even help this sort of thing to happen one day, because profit margins could be tighter and the focus could be on breaking even, paying authors and artists for their time and making sure everything is up to the correct standard before fans are allowed to buy it.